Happy Spring from everyone at Solutions Direct! Now that Winter is over, we're welcoming the new season with hot deals. Now through May 31st, take 5% off any order over $400. Just enter the coupon code below at checkout and if your order is $400 or more you will receive an instant discount. 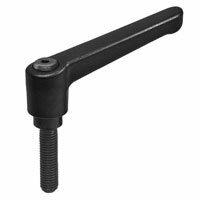 Adjustable levers are clamping components that offer a ratcheting feature that is especially useful in tight spaces. Their design also allows for easier visual adjustment to specific positions, and their ergonomic shape makes them user-friendly.